The person in question was Anna Anderson. She is known to be a charismatic and influential socialite with striking good looks. Her personality baffles investigators and people acquainted with the case and on one could tell whether this was a brilliant con act or the naked truth. 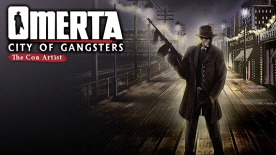 Experience the "Greatest con of all time" in this action-packed expansion of the Omerta – City of Gangsters storyline with a mysterious lady as a new gang recruit and a new district with an exciting scenario to complement the epic gangster tale surrounding “The Boss”.